Where has the solution been tested? In what mines were these made? Pcribing and Pilot There is 1 product. Órgiva, the safest mine in the world! 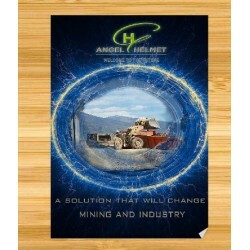 Angelhelmet Flyer This document describes on the page 2 the safety systems that are provided to the worker and on the page 3 the contributions of the solution to the company. We use third-party cookies to enable the use of the website and we do not send advertisements related to your preferences by analyzing your browsing habits, we do not send offers, information or newsletters unless an express request from the client is received by mail. Press accept to consent to its use. You can get more information in "Legal warning"